This charming Easter greetings postcard was published by La Favorite, presumably in France at some point during the 1910s. The real photographic postcard has been hand tinted and was almost certainly created in one of the numerous photographic studios operating in Paris during the Golden Age of postcard production. 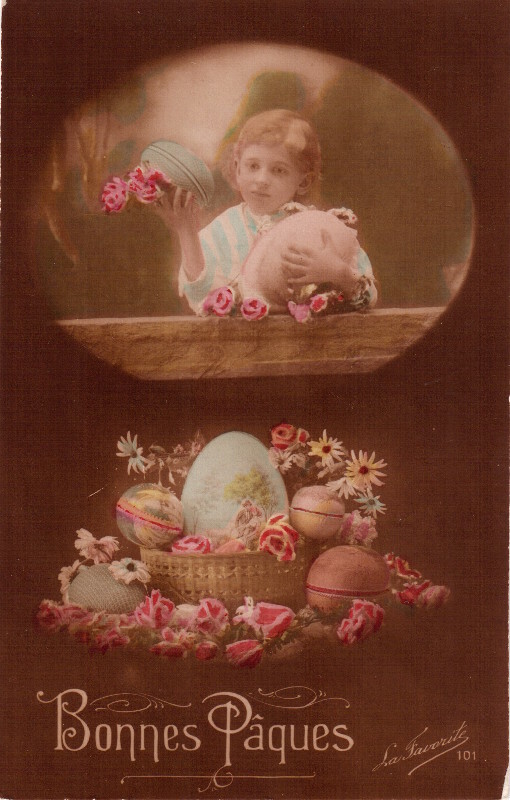 It’s a uncirculated postcard so there are no further clues – only the Happy Easter message “Bonnes Pȃques” in French and the publisher logo “La Favorite” in the bottom right hand corner together with an issue number 101. 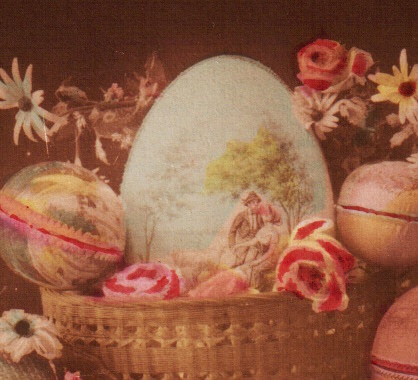 The level of detail in the painted additions is particularly fine on this card with the stock romantic couple motif reproduced in a lovely miniature on the largest Easter egg in the lower vignette. How lovely is this?! I don't know how I missed this post--except we were dealing with the insurance company, contractors and such from our chimney fire. I hope all is well with you and that we'll see you again for Postcard Friendship Friday. This is such a darling postcard.